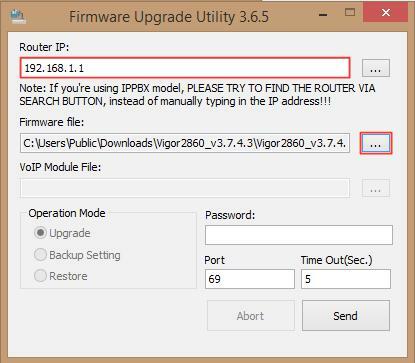 This document demonstrates how to upload firmware to a Vigor router by Trivial File Transfer Protocol (TFTP). To do this, you will need Firmware Upgrade Utility or other TFTP client software. 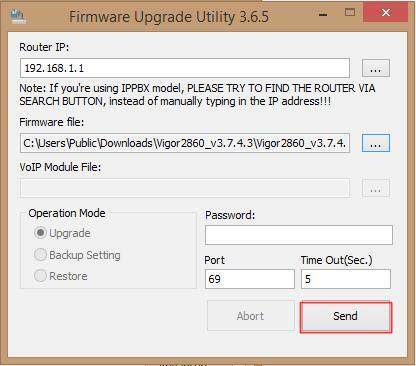 Here we use Firmware Upgrade Utility for example. 1. Connect you computer directly to the router's LAN port and configure the network adapter to have a static IP. 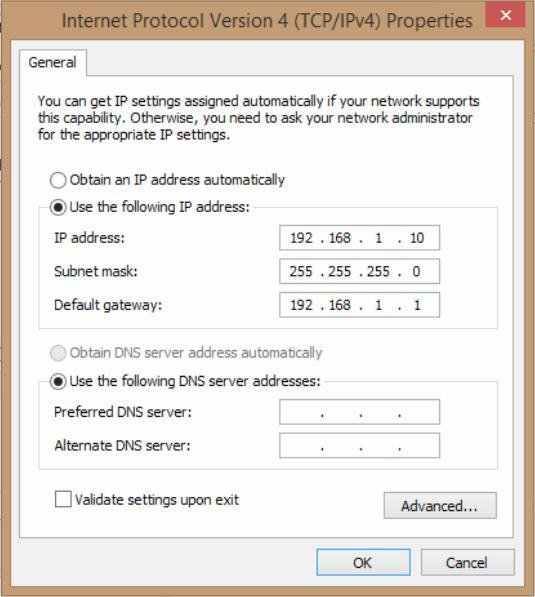 c. Enter Default Gateway as 192.168.1.1, which is default IP of the router. 2. Open Firmware Upgrade Utility (it should be run as Administrator) and get the settings ready. b. Select Firmware file: Click “…” and select the firmware file. c. Leave Password as blank. 3. Set your router to TFTP mode. a. Power off the router. b. Press the Factory Reset button and hold. c. Power on the router while keeping the Factory Reset button pressed. d. The left three LED lights will flash synchronously, this shows that the router is in TFTP mode. 4. Make sure the router is in TFTP mode, then click Send on Firmware Upgrade Utility, and wait for the file to transfer. 5. When the file has been transferred completely, the router will reboot and return to normal mode.